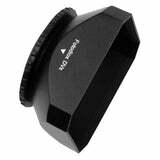 This extendable 3-section rubber lens hood helps prevent lens flare and reduces sun glare by extending and shading the front lens element from exposure. Since the end of the lens is extended, you get the benefit of some extra protection from accidental impact. The hood screws directly onto the filter threads of the lens, and can be extended to three different lengths to suit your lens length (wide, standard and tele). 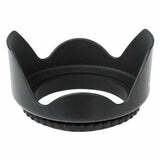 This lens hood maximizes the amount of hood coverage for the minimum amount of weight and hood area.